The NSE Nifty after shuttling between 10,441.90 and 10,341.90, ended 6.15 points, or 0.06 per cent down at 10,380.45. 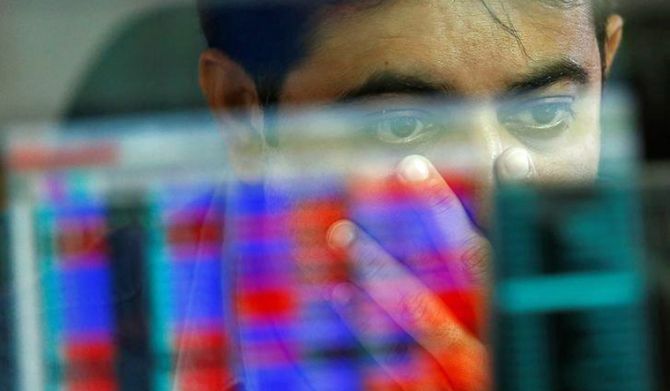 The BSE Sensex erased all gains in a highly volatile session on Thursday to end 10 points lower as losses in shares of software exporters and pharmaceutical companies offset gains in capital goods, banking and auto counters, amid unabated foreign fund outflows. The benchmark indices swung between gains and losses, with Sensex gyrating over 376 points both ways on alternate bouts of buying and selling. The 30-share index opened higher at 34,650.63 points and advanced to 34,679.93 points amid sustained buying by domestic institutional investors (DIIs), better-than-expected corporate earnings and positive global cues. It, subsequently, slipped into the negative zone to hit a low of 34,303.38 points as participants began booking profits and finally settled 10.08 points, or 0.03 per cent, lower at 34,431.97. Similarly, the NSE Nifty after shuttling between 10,441.90 and 10,341.90, ended 6.15 points, or 0.06 per cent down at 10,380.45. Market commenced the session on a strong footing on easing concerns around the rift between the government and RBI. However, emergence of profit-booking at every rise reversed early gains. Market was range bound despite a fall in oil prices and strengthening rupee as investors remain focused on quarter earnings, analysts said. Selling was more pronounced in information technology and pharmaceutical sector stocks amid recovery in the rupee. Shares of software services exporters were beaten down by the stronger rupee. The domestic currency firmed as much as 35 paise at 73.60 against the dollar (intra-day) at the forex market. Among Sensex constituents, Infosys emerged worst performer by plunging 2.90 per cent, Wipro shed 0.47 per cent and TCS down 0.15 per cent. Other laggards include Coal India falling 1.90 per cent, NTPC 1.85 per cent, Sun Pharma 1.31 per cent, Asian Paint 0.82 per cent, ITC Ltd 0.82 per cent, Kotak Bank 0.82 per cent, ICICI Bank 0.48 per cent, HDFC 0.44 per cent, RIL 0.42 per cent, HUL 0.40 per cent and HDFC Bank 0.03 per cent. Private-sector lender Yes Bank was the top gainer in the Sensex pack by surging 8.35 per cent in its biggest daily gain since October 11. Shares of Larsen and Toubro (L&T) climbed 2.65 per cent after the company reported 28.36 per cent jump in its consolidated net profit for the quarter ended September, 2018. Also, Axis Bank, IndusInd Bank, SBI, PowerGrid, Vedanta Ltd, Tata Steel, ONGC, and Adani Ports gained up to 3.51 per cent. Auto stocks, too, were in better shape after companies posted sales numbers for October. Shares of the country's largest car maker Maruti Suzuki, gained 1.52 per cent after the company on Thursday reported a marginal increase in sales at 1,46,766 units in October. Stocks of other auto makers such as Hero MotoCorp, Bajaj Auto and and Tata Motors too recorded gains of up to 1.22 per cent. The broader markets were in a better form with the small-cap index rising by 0.99 per cent, and mid-cap index gaining 0.73 per cent. According to analysts, currently many stocks are trading at oversold region while turnaround will happen on the basis of change in sector outlook or revival in earnings. Signs of turnaround were seen in mid and small cap which continue to outperform the main indices, they added. Among sectoral indices, the BSE IT index emerged worst performer by falling 1.78 per cent, followed by teck shedding 1.60 per cent, FMCG 0.65 per cent and healthcare 0.64 per cent. However, capital goods index gained the most by rising 2.34 per cent, realty (2.27 per cent), metal (1.29 per cent), infrastructure (1.227 per cent), consumer durables (1.03 per cent) and bankex (0.8917 per cent), PSU (0.85 per cent), power (0.80per cent), oil & gas (0.70 per cent) and auto (0.05 per cent). In the Asian region, Hong Kong's Hang Seng surged 1.75 per cent, Singapore up 1.76 per cent, Taiwan gained 0.43 per cent, Shanghai Composite Index up 0.13 per cent. However, Japan's Nikkei fell 1.06 per cent and Korea shed 0.26 per cent. In the Eurozone, Frankfurt's DAX was higher by 0.62 per cent, while Paris CAC 40 rose 0.31 per cent in their late morning deals. London's FTSE was almost flat.